May’s game will now be a traditional detachments k/spiel set in the late 1850s (see more in this below). May’s game will be a large Napoleonic-era battle played on the Metz map. The basic unit of manoeuvre will be the brigade, consisting of a varying number of infantry battalions or cavalry squadrons. Most brigades will be organised in divisions of two or more brigades, and the divisions will be grouped in corps. Artillery batteries will also be represented. Most players will be corps commanders. The essence of the game is on managing the battle effectively. The system recognises that armies are complex (and to a degree bureaucratic) organisations, and that it takes time for orders to be implemented. Thus a simple single brigade advance or attack, without artillery preparation, might take place with only a small delay. But a big attack involving perhaps two divisions with cavalry support can easily take well over an hour to plan and communicate to the commanders involved. It gets worse - a brigade or division which is planning its part in an attack, will be forced to abort its preparations if it becomes engaged. Its senior officers cannot do two things at once, and the current fight will always take precedence. Either the whole attack will need to be postponed or called-off, or it will need to go ahead without the participation of these particular formations. Of course the big complex prepared attack is likely to be more effective, but only if it’s not overtaken by such events. So there is a tension between taking the initiative and proper preparation. In this game you really can get inside your enemy’s decision loop; perhaps by putting them off-balance by launching a succession of minor attacks. As ever, it will assist in finalising the scenario if we have some idea of the numbers attending. Please therefore complete the doodle below if you are interested in this game. The system recognises that armies are complex (and to a degree bureaucratic) organisations, and that it takes time for orders to be implemented. How long does it take to empty the city of its silverware? Priorities need to be implemented. Yes indeed. Any corps which includes Uncle Billy has an additional amount of time added to all activities to allow for silverware acquisition, valuation, and subsequent sale to business 'associates'. In addition, such activities naturally take precedence over mere military manoeuvres. Ammo allocations are also reduced to take account of the required wagons. One of the strengths of our group is the willingness to try new periods and types of game. But there is only so much room in the schedule, and some players have recently asked me why we rarely run traditional von Reisswitz detachment kriegsspiels anymore. They do have a point. This is especially the case, given that we have just run Paul's 1809 grand tactical game, and our late May game was intended to be similar in scale and also Napoleonic. I have therefore decided to run a traditional detachments game instead, and set it in the mid 19th C. Most players will command mixed brigade-sized forces of infantry, cavalry and/or artillery. I hope that grand-tactical aficionados will not be too disappointed. I will run the other scenario at a later date. This Sunday's game at Little Gaddesden is, the last one before our summer break. It is a traditional detachments kriegsspiel set during a fictional war between France and the German Confederation in 1860. It is 8.15 am on 31st August 1860. The dawn mist has now cleared and it promises to be a beautiful day. Dusk is at 7 pm. 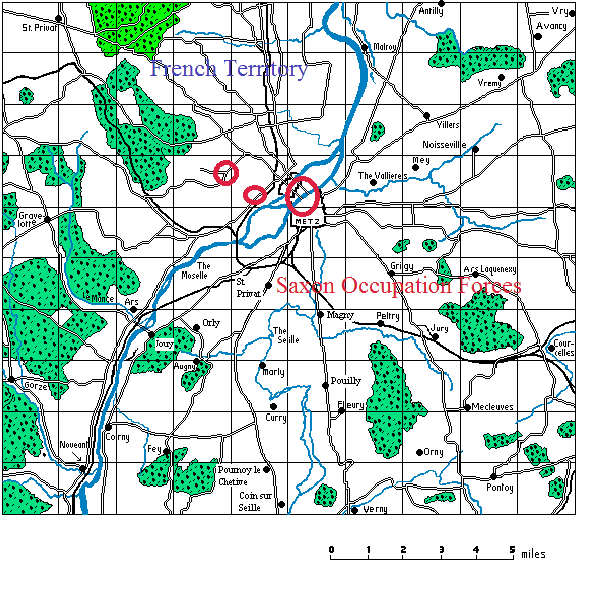 In the spring, a large army from the German Confederation (Red) launched a surprise invasion of France (Blue) and occupied the eastern province of Lorraine. The provincial capital of Metz fell quickly, as it was under-garrisoned, and the fortifications were in a state of disrepair. The bulk of the German forces have now moved away, leaving a part of the VIII (Saxon) Corps to occupy Lorraine. Work has been done to put Metz into a better state of defence. Apart from bridgehead fortifications opposite Metz, the Saxons have confined themselves to the east bank of the Moselle, which is effectively the line of demarcation between themselves and the remaining French troops in the area. The only bridges on either side of Metz, at Ars and Noveant, have been badly damaged and are currently unusable. The bayonet does wonders to entice filthy Germans to leave an area. Then the silverware inventorying can begin! But Uncle Billy, Lorraine is French territory! Surely you cannot be thinking of despoiling your own people? War is all hell and there's no refining it. What did you expect.....He is an Obama/Clinton fan or maybe Obama/Clinton are fans of him. What did he get the Nobel for? Holding up the left wing with his pinky finger??? This might be the only true news we see for the rest of the year. Relish this fact. OK going back to my corner.